When it comes to a battle between an alligator and Burmese Python, which would you pick as the top predator? 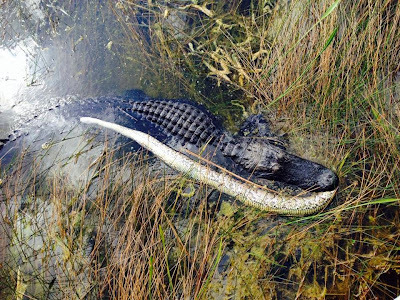 As it turned out in this case, witnessed by Steve Greene from a bridge—and seen in his photo above—it was the alligator. The Burmese Python is an exotic and invasive species living in the Everglades and I’m pretty certain the Everglades National Park was happy to see the alligator winning this battle, since officials have been trying everything to control the fast-growing population of Burmese Pythons in the park.